Ma che cosa è quest’amore che fa tutti delirar? But what is this love that makes everyone go mad? 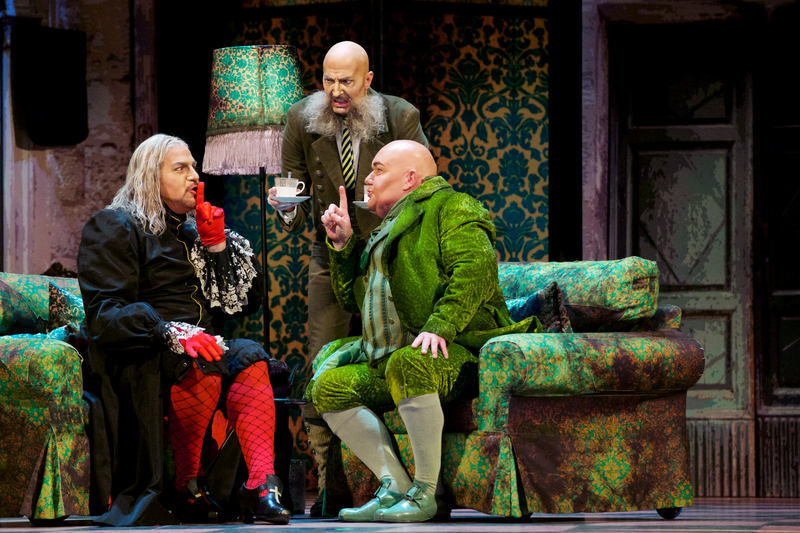 And in Seattle Opera’s current production of The Barber of Seville, boy, do they go mad. From the opening downbeat of Rossini’s famous overture (and it’s accompanying door-themed light show), it is clear we are in for a night of flashy, splashy fun. Director Lindy Hume has taken her production which premiered in Australia with Opera Queensland and brought it to life on our Seattle stage. The set, conceived of and brought to us by the brilliant Production Designer Tracy Grant Lord, is replete with incredibly colorful doors both functional and decorative. The costumes are as vibrant and eclectic as the scenery and only add to the feast for our senses. All of this sets the stage for one of opera’s great farces. The opera begins with the love-sick Count Almaviva trying desperately to woo the lovely Rosina. He is seemingly unsuccessful until he finds Figaro, the self-proclaimed “factotum” of the city. Together they hatch some incredibly harebrained schemes to get those two crazy kids Almaviva and Rosina together. 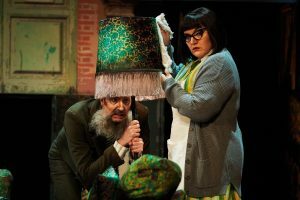 Meanwhile, Rosina’s caretaker, the bumbling and lascivious Dr. Bartolo, has plans of his own to wed Rosina and has enlisted the help of the crafty, calculating Basilio. Needless to say, madcap hilarity ensues full of mistaken identities, stolen keys, Elvis wigs, plenty of slapstick, and a Flamenco dance at the end. 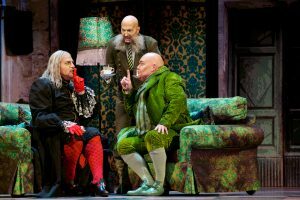 To pull off the hat trick of the demanding physical comedy, navigating Rossini’s formidable score, all while breathing life and even some grounded reality into these larger than life characters, requires some truly talented artists. This bar is more than cleared. With John Moore as the titular barber Figaro, we know we are in good hands from the moment he bounds onto the stage (Figaro is sung on alternate performances by Will Liverman). Moore manages to bring both hilarity and spontaneity to his introductory aria “Largo al factotum della città” and, shockingly, that is merely his jumping off point. 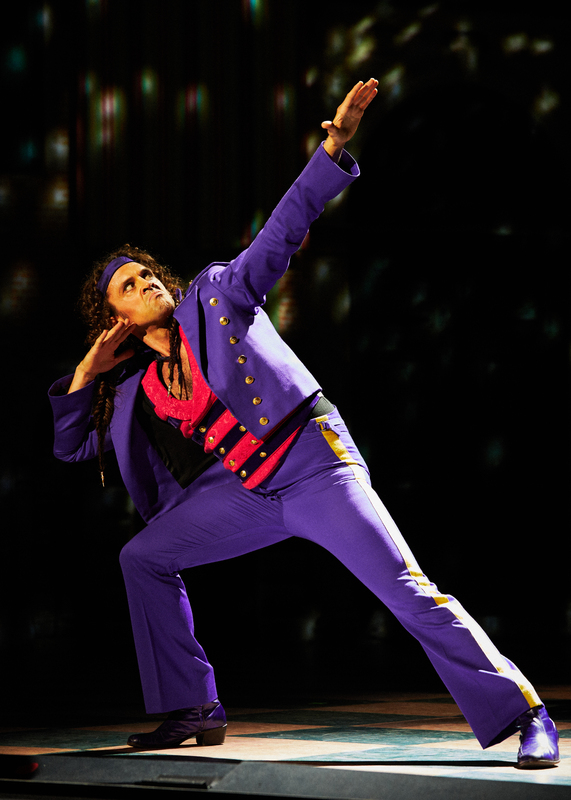 He commands the stage effortlessly throughout all the madness, all with rock star swagger to spare. As a fantastic foil for Figaro, there is the ever resilient Count Almaviva sung by Matthew Grills (Andrew Owens on alternate performances) with all the charm and charisma one expects from a pining tenor. He also is able to imbue the performance with an immense vulnerability subtly woven in with some very assured and beautiful crooning. 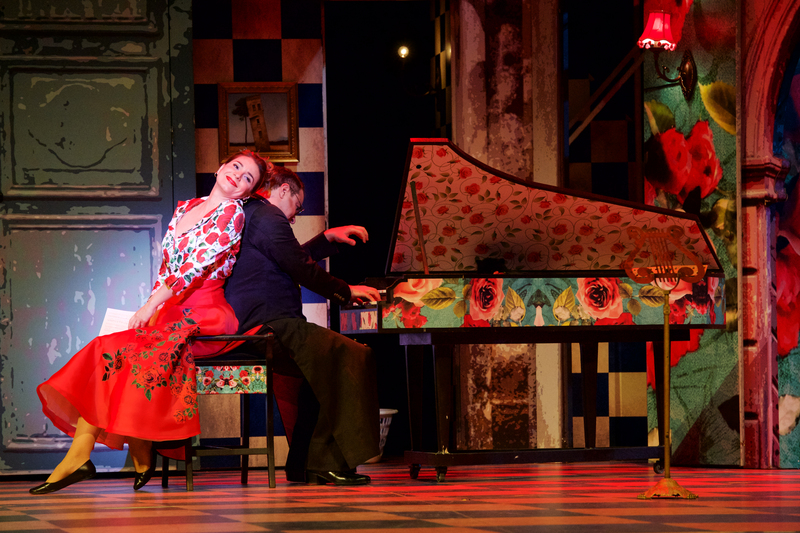 Filling out the pair of young lovers is Sabina Puértolas as Rosina (Sofia Fomina on alternate performances), the object of everyone’s affections. Puértolas has described Rosina as having a personality “like Champagne” and that is instantly apparent in her bubbly and vivacious performance. She is the very picture of a young teenager in love. If there was a way to communicate a valley girl accent within the speedy Italian of the recitatives, I swear I could hear it. While the trio of young troublemakers drives most of the action, what would the story be without our proper villains and supporting characters? Kevin Glavin has made quite a career of singing Dr. Bartolo and in this production it is clear why. He brings equal parts blundering buffoon and lecherous old guy which add up to the most perfect undesirable scoundrel. Dr. Bartolo is aided and egged on by the truly despicable Basilio who, if everyone is the star of their own story, is in the middle of a tragic Wagnerian opera, unaware of the opera buffa going on around him. Both of the basses have beautifully rich tones and some truly hilarious characterizations. Not to be overlooked is the omnipresent housestaff comprised of Mark Kenison/Waxie Moon as the silent Ambrogio and Margaret Gawrysiak as the surly maid Berta. Kenison is brilliant in his physicalization of the ancient servant. Gawrysiak is super sassy and is able to shine through the mayhem in her aria “Il vecchiotto”. In a first viewing, one could be forgiven for missing all the comedy Kenison and Gawrysiak are serving up in the background of all of the non-stop action of this production. One would be sorry though. When all is said and done, Hume and her intrepid cast present an unrelenting smorgasbord for the senses. There are times when the visual effects and stunts get in the way of clear storytelling but, it is a relatively minor sin hidden in what amounts to a thrilling and very satisfying night at the opera. The Barber of Seville can be seen at Marion Oliver McCaw Hall: October 14, 15, 18, 20, 21, 22, 25, 28, 2017. It is in Italian with English captions. Evening performances at 7:30 PM and matinees at 2:00 PM. For tickets and more information visit https://www.seattleopera.org/ or call 206.389.7676 or 800.426.1619.